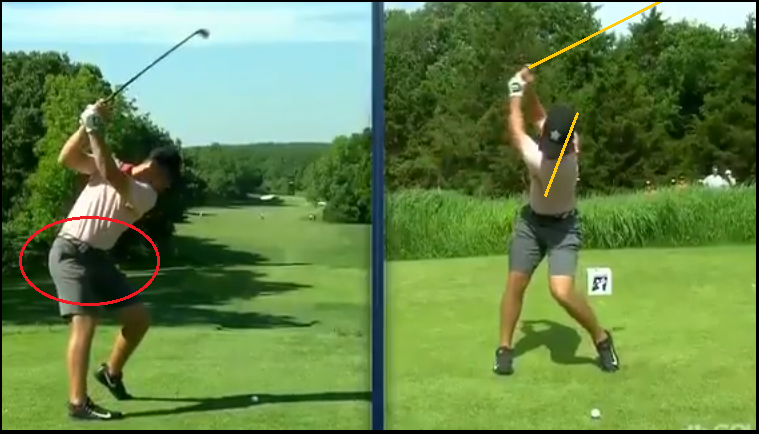 I’d say that, in addition to Jon Rahm whom I mentioned regarding this concept, Matt Wolff is the virtual poster-boy for this concept when you look at the lower and upper body. First, forget about the funky-looking back swing as it appears down the line and just look at two things – the hip turn on either angle, and the position of the arms at the top. 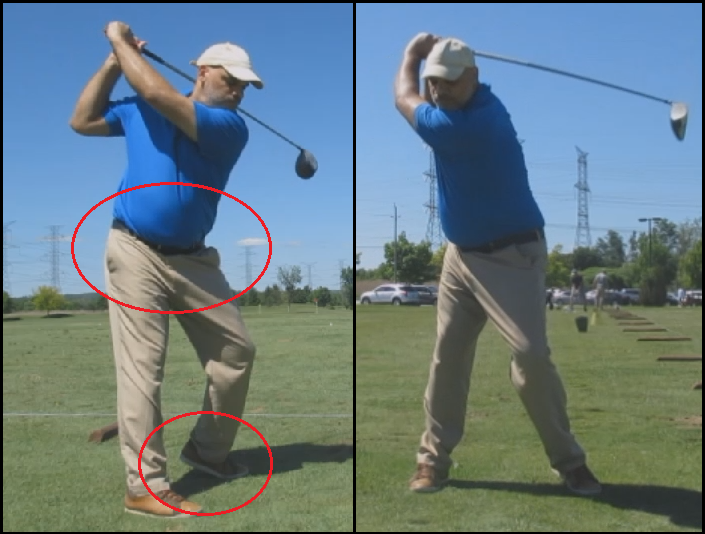 You see that with that high heel lift, he gets a great hip turn with the belt buckle getting nearly 90 degrees to his right from square to the target line at address, and yet even with that massive 90+ shoulder turn, his club shaft doesn’t get to parallel. So, what appears to be a short back swing because of the shaft angle will surprise people when he bombs it long, but looking that hip & shoulder turn – there’s no way he’s going to hit it except with massive power. That’s simple biomechanics, so when you hear of how twisting the lower back against resisting hips “creates” power, it doesn’t – it creates unnecessary risk of injury. You’d have more power with a hip turn to get the shoulders to 90 degrees or past, and Matt Wolff proves it. I was at the range on Saturday for the first time since Wednesday the previous week, and the only swings I’d taken were on the golf course in the charity scramble on the Monday past, and at the TXG Golf testing facility the Friday before. I was hitting a driver that Welshman had given me to see if I could hit it as he’d gotten it from someone who pronounced it “unhittable,” and you know that’s just the challenge I like. 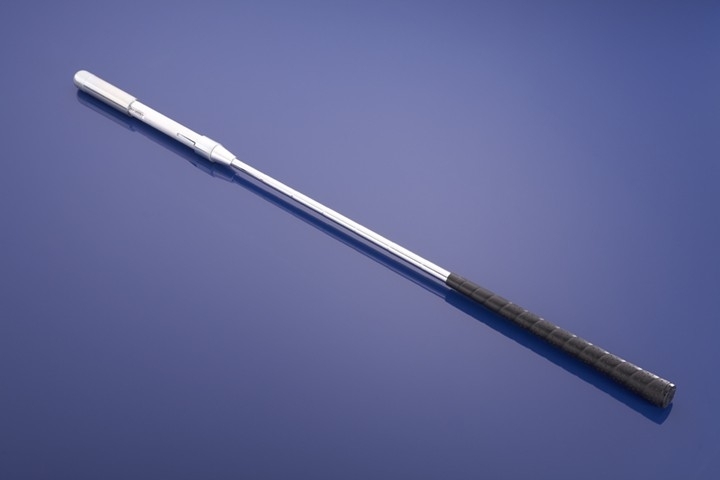 I haven’t measured the shaft length, but it’s a Ping G20 8.5 degree club with a TFC 169D Tour shaft, S-Flex (I could probably go with an X with a swing speed around 120 and slightly higher in swing-shape). Unfortunately, I forgot to put a new glove in my bag after having discarded a torn one in the charity scramble earlier in the week, and after a blister popped up on my thumb, I had to abandon the session. I’ll take some more cuts with the G20 when I have a glove on and can really go after it, and we’ll see how things look after I’ve worked some more on the concept with my SwingRite at home while working on the upcoming “MCS – Project 2018” video!